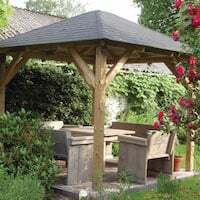 This post follows on from the Gazebo Installation Advice post. 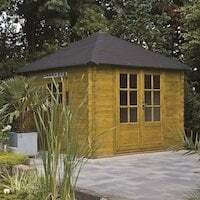 It will feature mainly pictures of the gazebo roof but the method is highly relevant to the install of a pyramid roof on a log cabin. Wood is a bugger and you really need to think about this when you are unpacking. 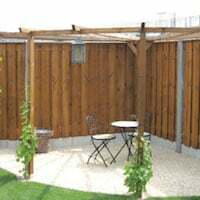 The roof is always the last part to be installed and while you are mucking about with the walls of your log cabin or the posts of the gazebo the roof parts will be lying around doing all sorts of things behind your back. We failed to follow our own advice during the install and had a bit of a problem. Rafters were perfect when we unpacked! When we unpacked the pallet everything was perfect. Come the afternoon when it was time to install the roof we found the rafters had bowed all out of shape. If we had stored them flat, out of the sun etc they would have remained straight. One was a cracking banana shape! Carry on using it knowing that you were a bit daft not to keep them safe. You will of course be able to sort this out and is not a problem at all. You don’t need to demand replacements at all, it’s easily resolved. Please note that this does happen with wood, it cannot be helped when it is unsupported. This will happen in a matter of half an hour so please watch out for it and follow our advice like we didn’t! We left them all leaning against another building so as the day wore on we had some bends and warps to contend with. Always lay parts flat, supported and shaded from the sun. If these are being left for over a few hours you can consider adding weights to the top to keep everything flat. This could have been avoided with the correct storage. Here’s an example from a log cabin roof, these could still be used with some adjustment as I’ll show later in this post, or, look after them properly so it doesn’t happen at all. Bowed rafter for a log cabin roof. If looked after properly after removal from the pack this will not happen. These could be used within the build, replacements are not necessary if you know what you are doing. It’s always important to have a 100% level base and to make sure the building is 100%. With normal apex roofs you can get away with it a little if it’s not but with a pyramid roof it is REALLY important. If you are not 100% level and square you will pay for it when installing the roof so please check this. Please see this page for more advice on bases. Be methodical and have a system. Don’t worry about it. Sometimes things don’t look right but it will all come together, you can spend a lot of time worrying about it. 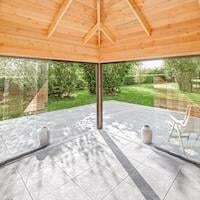 Realise that wood is wood, it cannot be precise by it’s nature but it can be worked with. Keep an eye on your safety as you will be working from stepladders. You may also want to consider using a scaffold tower. Make sure you identify all the parts correctly using a tape measure and the plans. Before you start it’s a good idea to run a tape measure over the various parts and compare the parts to the plans. 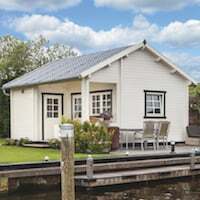 Some log cabins, mainly when there is a dividing wall or a gazebo to the side, will have a few subtle different sizes of rafters, identify all the parts first and be sure of their positioning from the plans. In this example the rectangular gazebo has a king pin that joins the end rafters to the ridge. ALWAYS use pilot holes before screwing. It’s a good idea to pilot everything that will be screwed into the top of the roof first as a batch. DO NOT pilot the bottom ones yet. Always use pilot holes before using screws. Preparation is key to this, I also like to find the center point of the ridge beam, if it’s a longer roof there maybe more marking needed, it’s easier to do it on the ground rather than a head of a ladder. Find and mark the ridge beam according to how many rafters that will be against it. In this gazebo my center rafter will be here. For bigger roofs you can also mark the ridge beam for the exact positioning of the side rafters. Fix the corner rafters to the king pin if applicable to your build. Some will be larger than others but the principle is the same when a pin is supplied. Screwing the corner rafters together. he rafters will normally sit to the top of the pin. If there is a chamfer on the pin it can go either way but looks nice facing down. Use a prop of whatever material you like to get the rough roof height, this helps greatly in your build. I tend to tack the corners of the rafters into the ring beam until I am certain they are in the correct position. Corner rafters lightly fixed with the kingpin being supported with a prop. Another example of using a prop. A customers ingenuity with his step ladder and a fishing rod? Another example of a prop being used, it really does help your install and in bigger roofs such as this it keeps things level. Now go to the other end of the building and again using a prop fit the corner rafters. The opposite end of the gazebo and fitting the second set of corner rafters. Again we are using a prop lightly screwed into the side of the pin. Both sets completed and stable. note the bracing we are using across the middle to make sure we keep everything inline. Fix the ridge beam to the king pin which you will have piloted beforehand. Props removed and all four corners in place the ridge beam fixed. Don’t worry at this point that it isn’t level or straight. If the measurements of the parts were correct according to the plan and you are sure you have used the correct parts then this will come good when you add the remaining rafters, at this point you can spend a lot of time worrying, please don’t. Log cabin corner rafters in place. It can often look wrong and not level but don’t worry about this at the moment. Wood and roofs can play tricks with you! You’ll notice that we’re using the wonky banana parts we accidentally made at the beginning by not following our own advice. We’re still not worried about them either as it will all work out – we had considered calling ourselves to make a complaint and ask for replacements but decided we wouldn’t get too far! Now you can start to add the side rafters into the king pin if applicable. I only fix the top ones first, don’t fix them to the walls or ring beam yet. You may want to check the fixings in the corner rafters at this point and fully send the screw home as we know they were in the right position as the ridge beam was reached and has been fixed. Fixing the corner rafters as we are happy with its position, it’s roughly level and has been spanned without a problem. Note, regarding the gazebo we are installing here we are using the longest screws through the rafter into the ring beam. For log cabins I also recommend screwing all rafters into the ring beam. It is strictly not necessary but I prefer to do it for extra strength. Log cabins will have notches created by the ring beam of the cabin and there is only one way to locate it. Technically you don’t need to screw through the rafter into the ring beam but I ALWAYS do this, weighing just short of 16 stone I like to make sure the roof is as strong as possible when I get on it to shingle. Log cabins will have notches in the main ring beam so location is easier. You don’t have to but I recommend you source some longer screws and fix all the rafters into the top log. The side rafters screw to the king pin, level with the top of it. Don’t let the fact that the ridge beam is slightly higher, it will all work. The following side rafters can now be added. We have already marked the location of them on the ridge beam so we don’t have to try measuring from the ladder. When rafters go to the ridge beam they will be flush with the top of the beam. We now start to make a few adjustments and there is a little bit of mucking about at this point, it’s best to be methodical and work with the building getting the ridge straight. It can take some adjustment, it may also be necessary to release the corner rafters again to get everything perfect. Take a slow and steady, thoughtful approach to this. Remember these pictures are of a gazebo, a log cabin generally has notches in the main ring beam for locating the rafters. Some pushing and pulling maybe necessary to locate them. See my advice above regarding screwing the rafters into the top log. Back to the gazebo install:- As we are confident the corner rafters are well positioned we measure the overhang either side of the center rafter taking our cue from the corner rafter overhang. Measure the center rafter. We want them to be the same either side. Also check that nothing has gone wrong with the top wall or ring beam, a quick eye to check it is still straight. Bracing normally keeps things nice and straight. 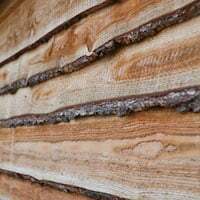 Log cabins will be easier as you will have numerous logs keeping it straight but please still check for straightness. Check by eye that the ring beam or top wall is nice and straight before fixing the lower rafters. Methodically work around the rafters getting the alignment just right or as near as damn it. Remember our banana rafters will be throwing things out slightly. If you need to push a rafter in slightly the clamp is very handy. We’re using the clamp to put some pressure on a rafter to push it in further. There was a slight bow in the ridge beam so with a little push we can take the bow out. Don’t forget to use pilot holes before screwing! Sometimes it goes really smoothly, other times it can take some playing with. 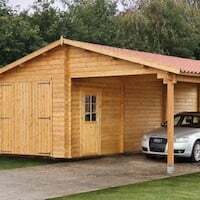 Please expect this as part of the building process with any pyramid roof on a log cabin or gazebo. This particular gazebo has some additional bracing. Additional bracing being fitted in the rectangular gazebo. Of the three size of screws we had in the fitting kit we’re using the smallest ones here. With that, the roof structure is complete, time to put on the roof boards. Roof structure completed ready to accept the roof boards. A log cabin roof complete and ready for the roof boards. We’ve still got a problem with the bowed wood we created. We did decide to ring the office and make a serious complaint, we even demanded someone comes and rectifies it for us. Unfortunately we were met with laughter by the sales team so we’ll crack on. Does this look like a real problem though to you, some fitters may worry over this? This is the worst bowed rafter on one corner. It’s a cracking example of a problem you can encounter with timber which can be easily overcome. We don’t want to start with this yet until we have the building stabilised, pushing on this to straighten it without strength elsewhere would not work so we’ll come back to worrying about this a little later. We’ve already sorted out our roofs into the triangle sections, this makes it so much easier and quicker and you can easily see how they are going to go together without confusion. 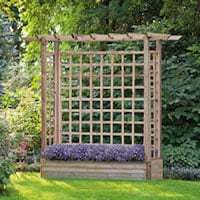 Please note with the gazebos you will also have spare straight end cut boards should you need them, don’t let them confuse you and put them to one side in case you need a spare due to a split or knot you don’t like. Roof section already laid out. This is the two shorter ends of a rectangular pyramid roof. Extended triangle laid out, two sets for both of the longest sides. Note due to the length the lower edge of the roof is made up of two pieces of board. 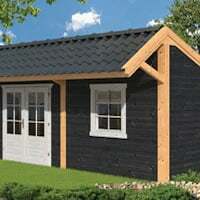 For log cabins you may have a center roof section instead with two outer triangles. Regardless it helps the install to lay out the roof section so you can see it before you install it. We had some discussions on the best way to do the roof boards and the best way to advise you. Both Wayne and I differed on how we did it and you may have a different idea as well, there really is no right or wrong way of doing this. I like to test a triangle section first so I will tack the first board and then lay in all the others. Tacking every few boards. This then tells me if the triangle is going to fit and whether I need to cut any boards, as I’ve only tacked it I can remove the boards and adjust easily. To minimise trimming I can raise or lower the triangle and perhaps only trim the leading edge board at the bottom. Once I’m sure it will work I then fix fully and use this as a template for the rest of the boards. This isn’t the way we have done it on this building example though. The is Wayne’s (Tuin UK Service Manager) method and seems to work very well, he’s fitted a few more buildings than me so I’m bowing to his experience on this one. You may well have a better method. Tacking a roof board, all around on the first layer flush with the bottom of the rafter. Tack your first roof board and carry on around the whole building first, this will tell you the alignment is correct, it should be sitting roughly to the center of the rafter. Don’t worry if they don’t meet together perfectly, if you’re happy with the alignment then nail home fully. One roof board all the way around on the leading edge flush with the bottom of the rafter. After again assessing the building and our self created bananas we decide to start at the place that is the best, this is the furthest away from the really bad bow. There’s other smaller ones we created by our dodgy storage the we want to remove as well. Using a plank and our trusty clamps we remove the bows as we go around the building. Using clamps we can brace off other rafters and push or pull the bows out as we fit the roof boards. We then add five more boards and fix them with the nails provided. Don’t be tempted to use a nail gun. Don’t be tempted to use a nail gun when you’re doing the roof, please use the nails we provide. Two nails in each board across every rafter. Note the gazebo roof boards are flat edged, all the log cabin roof boards are interlocking Tongue and Groove. Steadily work around the building, if you have to you can remove slight bows as we are doing with a clamp and plank. We now come to the worst bowed rafter we looked at earlier. As we have now boarded all the other sections of roof we have stabilised the building more and given it a lot more strength to brace against taking the bow out is now no problem at all. Badly bowed rafter which will not look very nice from inside. This is easily removed as below. A little bracing is all that is needed to bend the bow out when the roof boards are nailed on. This bow will be removed and will disappear, adhering to the shape we’ve asked it to maintain. What bowed rafters? There’s no bananas here! This is what I love about wood. By working with it and thinking about it most things can be overcome. Wood is very flexible and can be moved, pushed and cajoled into working with us. We can carry on laying the rest of the boards on this gazebo, do not worry if it’s not particularly neat where it joins. As long as you can nail it on the rafter it is fine as all will be covered by the roof covering. Don’t worry too much about the join at the corners or other rafters, all this will be covered. When you come to the small triangle pieces at the top of the roof it’s a good idea to pilot hole them or you will break them guaranteed. Always pilot hole the small pieces at the top of the roof to stop them splitting. As I said there is always adjustment and cutting to do with any roof and this was where we needed to trim on this particular roof. The last two final boards needed trimming to fit. As expected and normally you would have to do more. Not bad considering we had big bows as well. With the roof structures and boards on the final roof covering can now be added. You have the choice of Roofing Felt or Roof Felt Shingles. The latter looks for nicer and lasts forever. If you are fitting roof shingles please see the advice and videos on the shingle page linked to a couple of lines above. For flat roofs you have a choice of either EPDM or Easy Roof Membrane. You could also use the ERM on apex roofs as an alternative to felt. Gazebo roof structure complete ready for the final roof covering. Roof structure and roof boards complete on a log cabin ready for the final roof covering to be applied. The square, pyramid roof construction of a log cabin is pretty much the same as the rectangular roof described above. 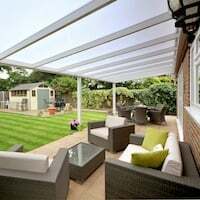 For the square roof gazebos it is a little different and uses a truss system making it easy to do and a lot less complicated. This looks good in a gazebo but I wouldn’t want this system in a log cabin. Square roof truss system used in making a roof on a square gazebo. Square gazebo roof construction using truss type beams. Some buildings will have additional corner rafters as the above and below pictures show (the ones in the corner). I will fit these after I have put on some of the roof boards as you can then push it up into the roof boards for a perfect fit. For a log cabin you will need to put them in the notch before the roof boards go on. Corner bracing coming from the corner rafters could be fitted after a few roof boards have been put on, you can then push the rafter up to them for a 100% perfect fit. There are different ways of doing things, you could also start from the top of the roof as this install was done, there really is no right or wrong method and all fitters will chose their own. This page is only my advice and you may have a better idea to accomplish your install quickly and easily. You could also start from the top of the roof. There is no real right or wrong way of doing it, just personal preferences and what works for you and what you feel comfortable with. Note the smaller kingpin in this roof. I have come across one or two buildings where the roof boards are not pre-angled. 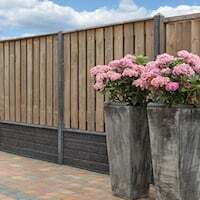 I actually prefer this as you simply nail them in, mark with a chalk line and cut down the line, to a certain extent it saves a lot of mucking about getting the perfect fit. I prefer roof boards like this, they can just be nailed on and cut down to get a perfect joint on site. Finally please only use nails in your roof boards, a great deal of the overall strength of any building comes from the roof. Two nails in every board across every rafter. And please, NEVER use staples in the roof like this customer did. Staples used in the roof construction made a VERY weak building and it didn’t fare will in a huge storm with the roof boards lifting in places. 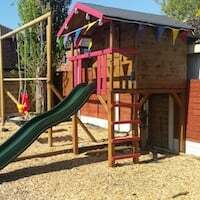 This entry was posted in Gazebo's, Log Cabin Fitting Tips and tagged fitting, gazebo, installation, log cabin roof, pyramid roof, roof by Richard. Bookmark the permalink. Can you screw he roof boards to the rafters rather than nail as once in a nail can be difficult to remove ? Yes, no problem, we often advise this if you are planning on taking the building down at some point. Very detailed and helpful advice. Looking forward to building my cabin later this month. It is recommended not to use a nail gun. Is there any particular reason for this as it makes construction easier and nails can be of a corrosion resistant nature. Please bear in mind this is only my personal recommendation. When you use a nail gun make sure it is adjusted properly. The main problem I have seen is where the nail is fired through far too far. Also if you want to take the building apart again it is nearly impossible to save the roof boards if a nail gun has been used. Personally I also found them heavy to work with while on the roof and find it far quicker with a hammer. Of course though it is upto you and your preference but please make sure the nail head is level with the top of the roof board when complete and not sent it too far.